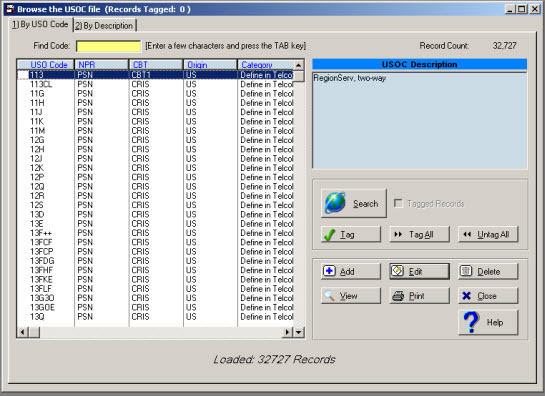 USOCodex™ is a Computer software database of USOCs, which requires Microsoft Windows XP or later. The software features fast USOC search or lookup capabilities. In addition, USOCodex™ provides features to import additional or new USOC list using a standard CSV type file. Plus, USOCodex™ provides a feature to export the USOC list to a CSV file or it may be copied to a Microsoft Excel compatible file (requires Excel 2003 format Excel.xls). Today, USOCs or ISOCs and/or Codex are used by many Network Carriers as a short-hand schema to uniquely identify a component of the network or a service, which may be delivered via the network. There are thousands of USOCs, many are unique to specific carriers, and many still remain universal or a uniform standard for the world-wide network.